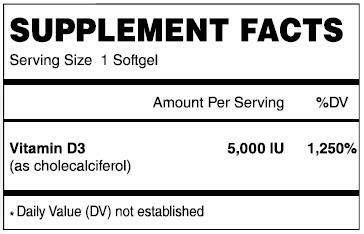 Vitamin D3 promotes bone, cardiovascular and immune health. Current research shows that most of the population is deficient in this very important vitamin. Directions:As a dietary supplement for adults take one (1) capsule daily, with a meal, or as directed by a healthcare practitioner. Other Ingredients: Extra virgin organic olive oil, MCT oil non-GMO modified cornstarch, Carrageenen, Glycerin, sorbitol, purified water. Warnings: If you are pregnant, nursing, taking any medications or have a medical condition,please consult your healthcare practitioner before taking any dietary supplement. Disclaimers: These statements have not been evaluated by the FDA. This product is not intended to diagnose, treat, cure, or prevent any diseases.